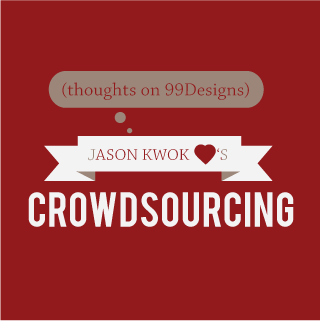 I am a fan of the crowdsourcing design website, 99Designs. Back in high school, the story of Mark Zuckerberg and Facebook captivated my imagination and opened my mind up to the potential of the Internet. There is so much that can be done. I always get a little kick of excitement at progress with taste of bitterness when I see other people independently launch society-benefiting ideas that I once thought of. For example, there is pricegrabber.com, a tool that allows shoppers to compare good prices and there is quora.com, a question and answer community. Jealousy aside, I celebrate that these organizations are transforming and improving how society functions and communicates. This should be commended. 99Designs is one of these companies and it is transforming how people find designs and how designers find work. 99Designs acts as a very efficient marketplace for designs. Anyone who needs a design made for them (a logo, a website redesign, a tee-shirt, etc) can host an open competition with a prize. Designers look through the listed competitions and submit entrees to when they feel they can do a good job to or the compensation is attractive enough. 2. From the perspective of someone who has shopped for designers, I would love to use 99Designs. This forum of open competition may not bring a fully cohesive branding team, but it provides affordable designs that are fairly (from what I’ve seen) decent in quality. I previously feared overpaying for a subpar design. 99Designs is a solution to both of these problems. If I didn’t learn how to design, I would use it in a heartbeat now. 3. From the perspective of a designer, I have mixed feelings. New entrants and small time players should be rejoice at the consolidated system that groups all shoppers in one platform. Disregarding the presence of skill, I can’t think if an easier way to try to break into this arena by only focusing on art. But because 99Designs makes entering so easy and prices so competitive, I could see how it could easily hurt existing players. However, I feel that fighting this trend is like resisting the switch to advertising on Google.com because its putting YellowPages businesses out of business. While 99Designs may not sport a completely professional and dedicated team of designers, there is a substantial amount of merit in allowing hundreds of designers to compete and leave behind one, best design. As a designer, I have found that inspiration comes in flashes. Sometimes I look at a project and immediately come up with a perfect idea. Other times, I labor and think for weeks and only to churn out garbage. This allows those with genius ideas to surface. 99Designs describes this phenomenon as “crowdsourcing.” I’ve never defined this concept into the word “crowdsourcing,” but I love how 99Designs is acting on it. I support 99Designs and how it is making the design market more efficient. I understand there are other companies like this out there, but I focused specifically on 99Designs because its one of the bigger players and its team came from SitePoint.com, a website I am familiar with. It will be interesting to see which crowdsourcing design firm will do it best and emerge as the dominant firm.